We know that forklifts come with certain caveats for safety: we know it’s important for a forklift operator to know his or her machine, that an operator should remain in his restrain when the machine is in use, that the operator should always keep three points of contact on exit, and, when the operator is driving the forklift, to not drive the machine with the lift up. 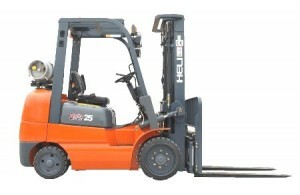 Equally important is the importance of training; even the most seasoned forklift operator should try to continue to learn and improve upon his or her technique, and his or her knowledge of the machine’s capabilities. It’s also important to check loads before picking them up. Yes, it’s important to keep to a schedule and to work efficiently, but not at the cost of the operator’s, or another employee’s, safety. When the forklift operator picks up a load he or she should check that the load is stable; check the load is of appropriate dimension to transport safely. Also make sure that the load is properly centered. Slightly tilt the forklift mast before the load is lifted off the ground. Then, when the operator is ready to travel, he or she should always keep his or her gaze in the direction of travel. If clearance is challenging, the operator should use spotters; he or she should also use mirrors and other aids to ensure that the load is transported safely. The forklift operator should perform routine checkups. Operator should know their machines; each day they should know fluid levels and tire pressures, they should know that the seatbelts are working properly and that the mechanical devices such as the horn, lights, backup alarms, etc., are in proper working order. If a machine has shown to have the potential for breaking down, for becoming a hazard to the safety of those in the warehouse, then it’s time to get the problem fixed. If you have any questions about forklift safety, or if you would like to speak to the forklift experts at Anderson Forklift about your next machine, then call today.